The chef of a well-reviewed restaurant. After meeting Scrooge, he was encouraged to come to Twilight Town to open a bistro, where he has been using ingredients from other worlds to further his culinary talents. Little Chef is a character in Kingdom Hearts III. He is a rat with a talent for cooking, and is the chef of Le Grand Bistrot in Twilight Town. He originated as "Remy" in the Disney/Pixar film, Ratatouille. Sometime during his travels, Scrooge McDuck encountered Little Chef after enjoying one of his dishes. As Little Chef wanted to expand his culinary horizons, Scrooge took the little rat's desire as an opportunity and financed Le Grand Bistrot in Twilight Town to help Little Chef fulfill his dream. Sora, Donald, and Goofy encounter Little Chef in the woods outside Twilight Town, where he is pursued by a group of Heartless and has left his collection of fruits on the ground. After the trio fend off the Heartless, they prepare to leave, but Little Chef takes control of Sora and uses him to collect his missing fruit. Though Sora is able to retrieve Little Chef's fruits, he is unable to understand Little Chef's intent to cook with them, and the trio bid Little Chef farewell. Later, the trio encounter Scrooge, who offers them a tarte aux fruits Little Chef made as a token of gratitude for recusing him from the Heartless. Scrooge informs them that Little Chef is the chef of his bistro, and explains how he first met Little Chef and the origins of the bistro. Little Chef wants to cook more culinary delights for Sora and company, so Scrooge has the trio venture forth and collect ingredients for Little Chef. Little Chef is a rodent, though much smaller and less humanized than Mickey Mouse. He resembles a real rat, grey in color. Little Chef is a skilled chef, being capable of taking various ingredients and using them to make meals. He is also capable of controlling Sora's movements by moving his hair and can do so with ease even after having just met him. 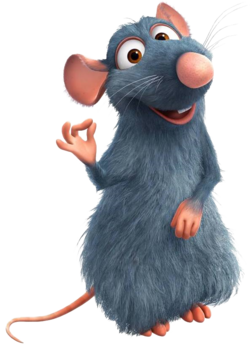 Little Chef first appeared in the 2007 Pixar animated film Ratatouille as Remy, voiced by Patton Oswalt. In Ratatouille, Remy helps a chef named Alfredo Linguini with his meals by hiding under his hat and controlling Linguini's movements by moving his hair. Because Remy is a rat, he can only communicate to Linguini using body language. Like the characters who meet him in Kingdom Hearts III, Linguini only refers to Remy as Little Chef, due to not knowing his name or being able to speak to him. Scrooge's meeting with Little Chef in the backstory parallels the ending of Ratatouille, where food critic Anton Ego asks to meet with the chef and discovers Remy is responsible for his dish; both characters end up financing a later restaurant where Remy serves as head chef. This page was last edited on 14 April 2019, at 20:28.